Join us for an educational flight of Owl Spirits and one of our seasonal or signature Handcrafted Awesome Cocktails. 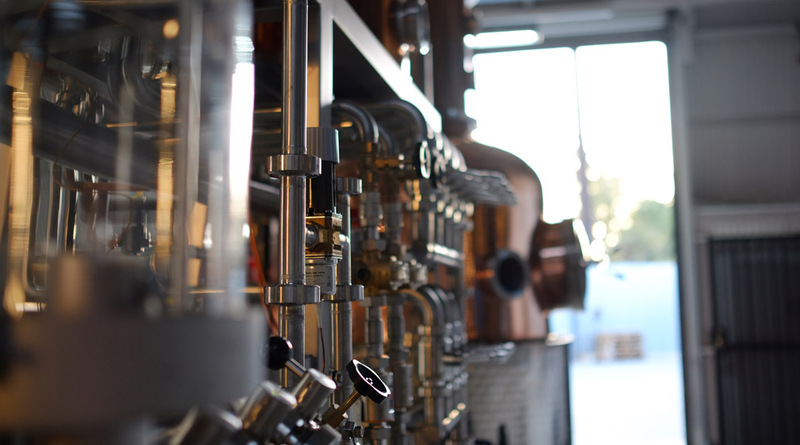 The beautifully designed tasting room offers amazing views of our production facility and highlights our Spirit Maker (hybrid copper still) which is named Bastian Penelope Coco Frigalicious. Bottles of our spirits are available in our tasting room for purchase along with glassware, t-shirts, hats and other awesome goodies. While we do invite you to stop by for and enjoy one drink or a tasting flight, we are unable to serve you more than 1.5oz (one cocktail or one tasting flight) due to our Craft Distiller License Type. We sincerely apologize, but the State Alcohol Beverage Control is extremely strict on the way we do private events and, unfortunately, they were not in agreement with our previous system of last minute parties by phone and instructed us change the system. So frustrating— we know. Believe us when we say it would be much better for ALL if we could serve you more! We have a lovely new menu so if you are in the area please stop by. We ARE allowed to have private PARTIES/EVENTS. Since we have to guess as to what the ABC would deem appropriate for a party, we’ve come up with these guidelines. If you have a group who would like to get together for a celebration we are more than happy to accommodate you. Please email at least 24 hours in advance. We must confirm your party by email prior to arrival. Please note, if we don’t think the ABC would consider you a valid private event, then we must deny your party. We have designated areas specifically to host our private events. The ABC decided that we must separate the private parties from our tasting room, so we have redesigned our patio to accommodate our party guests. We will not be able to schedule an event over the phone. Tour reservations are STRONGLY RECOMMENDED to secure your spot on a tour. A truly educational experience, your guide will take you on a “BEHIND THE SCENES” tour of the facility. The tour is 30-40 minutes with plenty of time for questions. Following your tour, you will enjoy samples of our spirits. RESERVE YOUR SPOT HERE to ensure a spot on the tour. Celebrating something and want to enjoy more cocktails after your tour. Please email events@blinkingowl.com to make arrangements for your party/event or we are limited as to what we can legally serve you. You must check in 15 min prior to your tour time or your spot may be forfeited. All persons must be over 21. We can not accommodate any children at the distillery. Please check in 15 min prior to your tour time or your spot may be forfeited. CANCELLATION-Please email cancellation requests to info@blinkingowl.com.